Took me awhile, but here is the new design. 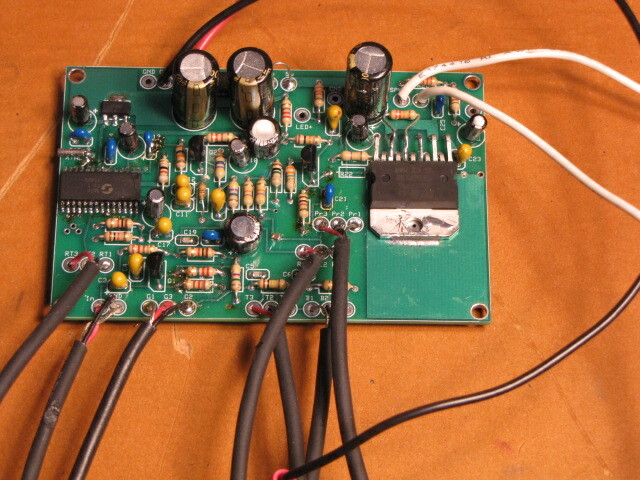 It’s very similar to my original design https://circuitsalad.com/2012/08/31/20-watt-battery-powered-guitar-amplifier-circuit/. I am still using the FV-1 DSP chip for reverb which sounds great – but you can leave it out. I moved the position of the volume control after the first preamp and this helps the loading of the guitar and improves the noise figure a bit. I added a presence control in the negative feedback loop between the final amp the driver stage – this really adds some nice high end sizzle – if that’s your thing. The topology including: the fender type tone stack and the output feedback from the speaker back to the driver is much like a classic tube amp and to my ear has a nice sound. 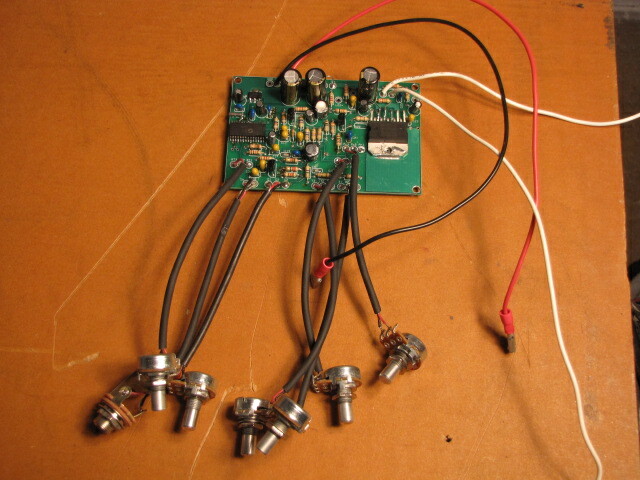 One big change was the replacement of the JFET preamp stages with Darlington transistors. You can make your own out of two generic npn’s or use another than the one I specified. Alternatively, you can use a Mosfet like a 2N7000. This may require some adjustment of the biasing. The reason I changed this was that the JFET biasing from device to device was fussy and so my schematic biasing values did not always work out correctly. The Darlington biases very consistently and I love the sound. Another reason was just for the fun of it ( don’t usually use the Darlington much). Lots of options to adjust the tone stack, treble boost in the first stage, the feedback loop on the final and the reverb tone shaping. I am sure if someone puts some effort into it, they can dial in some further improvements. The FV-1 has multiple selectable effect programs. The last reverb program is hard wired( all three pins pulled high) but these traces are on the bottom and can easily be cut. There are ground connections right next to these pins so that one can cut a given trace and connect the pin to ground, changing the program. The FV-1 has a good data sheet and explains this in more detail. The final amp is the TDA7396 which is capable of cranking out up to 65 watts(2 ohm speaker) – it is easy to work with and current in production. It works well with 10 – 16 volts and in this design is intended to be used with a generic SLA 12 volt battery or a 12-14 volt @ 3 amp supply. There are only a few surface mount parts, the PMOS FET I use for polarity protection, the FV-1 and the 3.3volt regulator. 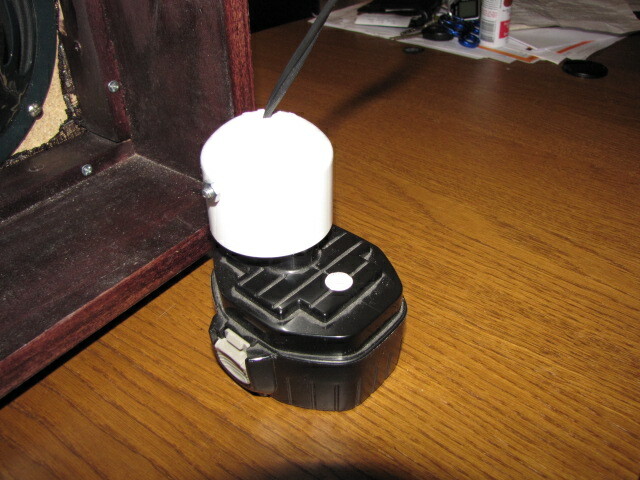 The polarity protection can be left out or a rectifier can be used instead. Other 3.3v regulators can be used also. If you leave off the FV-1 – you don’t need the regulator at all or the two reverb controls, and it will just work as is. 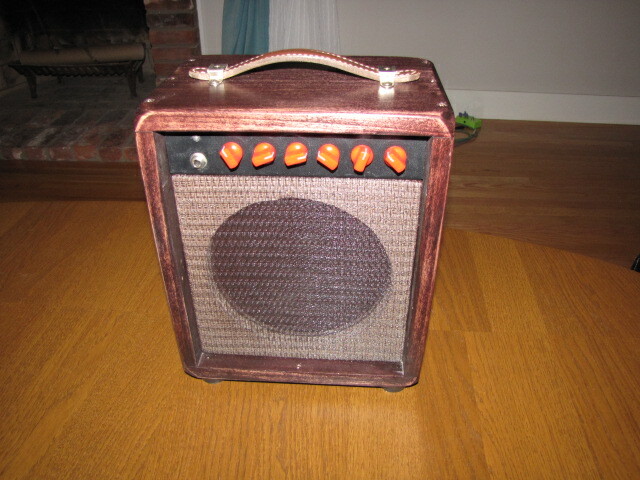 the controls on the AMP are: Volume, Treble, Bass, Reverb room size, Reverb level and Presence. 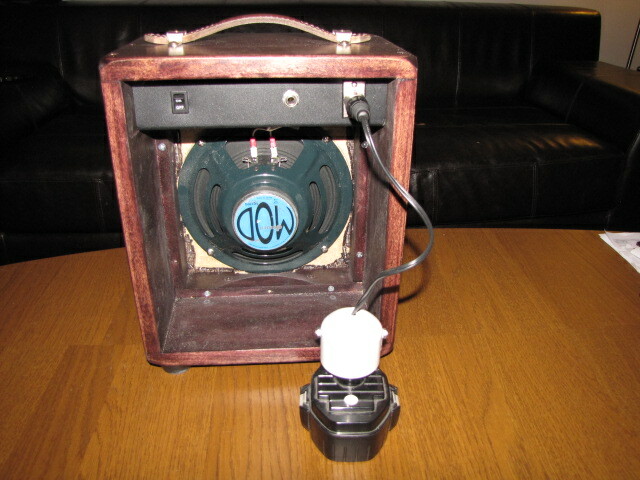 For the speaker I used a $22 Jensen 8″ MOD 4 ohm. I highly recommend this speaker – its cheap and sounds just right for this amp.